After you add some pages it’s time to view and share your live application! These pages will each open at a special knack.com URL. You can share these URLs with your users so they can access your application. 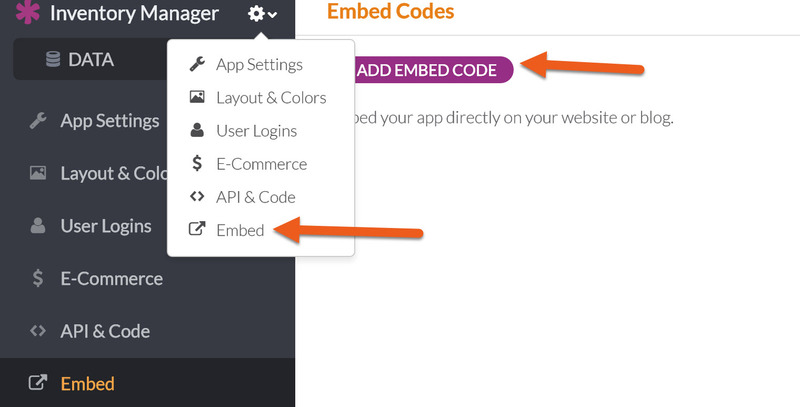 Along with viewing your app at the URLs above, you can also embed any page from your app into your own website. Copy the code and paste it into your own blog or website. Your app will adapt to the surrounding colors and design of your site and look perfectly integrated. Click here to learn more about embedding your app. When you view your app, you have an option to show a global page menu. This is a big menu that appears at the top of the app displaying a link to each start page (when you have more than one). You can edit each start page and choose whether to include it in the menu, as well as decide whether to show the entire menu when viewing that page. You can also add a custom icon for each page and update the page name that is included in the URL. Users Logins are used to limit access to your pages. You can add a login to any page. This means a user must login with an email and password before they can access that page. User Roles are used to define different types of Users, such as Manager vs. Employee or Admin vs. Client. By adding logins to your page and creating users who can login, you can define User Permissions and share different pages of your app with different users. In order to login, a user must have an account record in your database with an email and password. You can add these accounts directly in the database, or let users register right from your site. Once you’ve shared the app URL, users can navigate to others pages with logins that also allow access to their assigned user roles using the global page menu (see above). 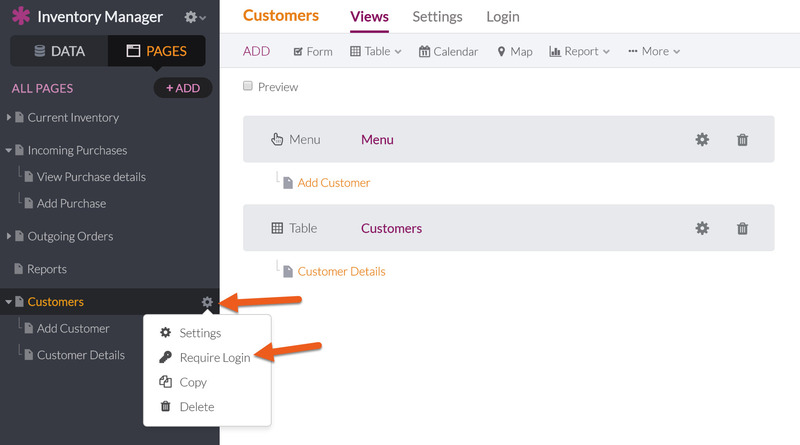 You can also add views to work specifically with the logged-in user. This is perfect for creating apps where each user will only see their specific records. For example, you could create a customer portal where each customer can see their own invoices, and not invoices from any other customer. If your app is open while you’re making changes in your Builder, you can refresh the app to see those changes go live. You’ll likely want to test how your live application works when you’re still in the process of building it. Viewing your app as a user can help ensure that you’re on the right track and have your pages and views set up properly. Pages that aren’t protected by a login view are viewable by anyone who knows the URL. Up next, learn how to Do more with Knack.